This post is by Jonathan Devasagayam, Biomedical Engineer, Rwanda. As we wrap up our work for OOH Rwanda 2012, it’s great to see the progress that is being made with infrastructure and equipment at King Faisal. The installation of a new oxygen concentration plant has provided us with a steady supply of good quality oxygen for our visit this year. A hospital wide uninterruptible power supply has meant we haven’t been subject to the mains voltage fluctuations that we have had in previous years (anyone reading this from St. George Hospital can you tell our GM that I want one in Sydney). In ICU we used predominantly King Faisal owned patient monitors and ventilators which is a first, and the monitoring in the Theatres has also improved since our last visit. It has been great working again with my Rwandan counterparts Kumar, Jacques and Sylve from the Biomedical Department and Joshua and his team from Maintenance Department. 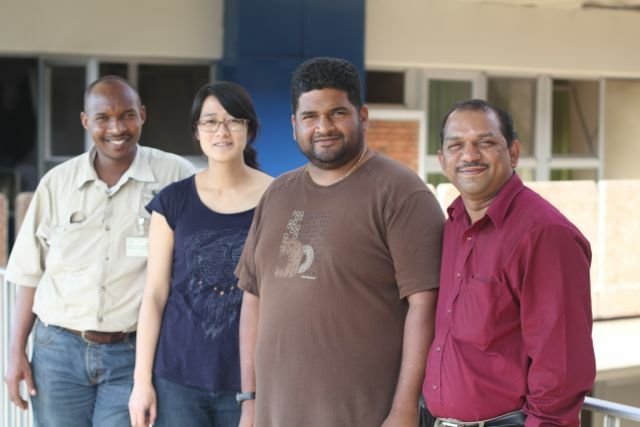 Kumar has been involved in OOH Rwanda since our first visit in 2006 and his help has always been invaluable. Finally, this year i’ve had the pleasure of working with Shirley, a talented up and coming Biomedical Engineer from Sydney. Though she came here not knowing quite what to expect on her first trip, she quickly to adapted to the challenges of working as an engineer in this environment. Shirley enthusiastically took to all of the tasks of an OOH Biomed from fixing the electrosurgical unit between cases, to helping the post op kids out to the lawns to kick the soccer ball around. Shirley, on behalf of the entire team we’d like to say… while there are many bugs we wouldn’t want you to get bitten by in Rwanda… but we all hope you have been bitten by the OOH bug!